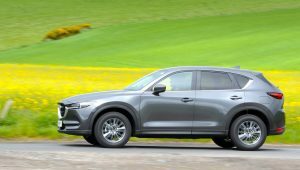 The new Mazda CX-5 builds on the strengths of the previous model in an effort to further capitalise on the demand from motorists for SUVs. 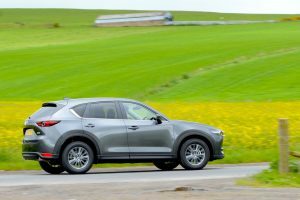 The Mazda CX-5 has benefited from the increasing demand from motorists for SUVs, and the new model aims to capitalise on this further. 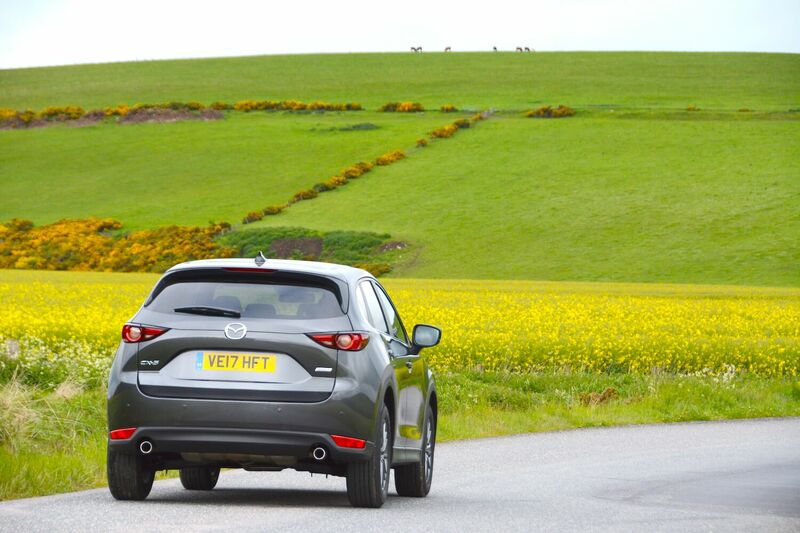 We were on the launch of the previous Mazda CX-5 model in Scotland back in 2012 and it was great to drive. Can the same be said for the new model? 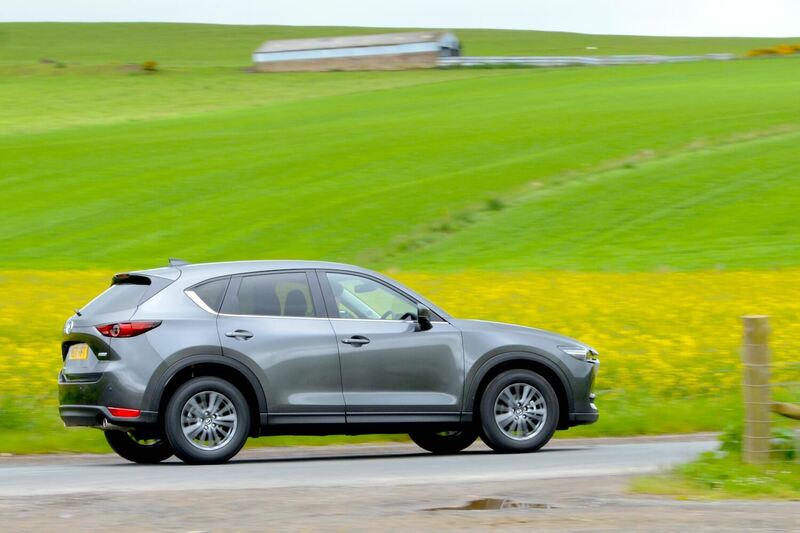 The Mazda CX-5 has an elegant and simple design. Although the overall shape hasn’t changed that much, there are new details such as the sleeker front and rear lights compared to the outgoing model. Mazda’s design philosophy is to ‘subtract’ rather than add; it’s an approach that we’re in favour of, and it works well. However this strategy falls down somewhat with the wheels on our test car, which were more fussy than the rest of the car put together. The 17-inch wheels with high profile tyres may help the ride quality and aren’t as vulnerable to kerbs and rocks, but the large alloys on most SUVs today reflect the desire of motorists for good looks in preference to off-road ability. And it has to be said that the grey colour of our test car does the CX-5 no favours at all. It looks much better in a brighter colour such as Soul Red, or even the blue of the car on the launch five years ago. 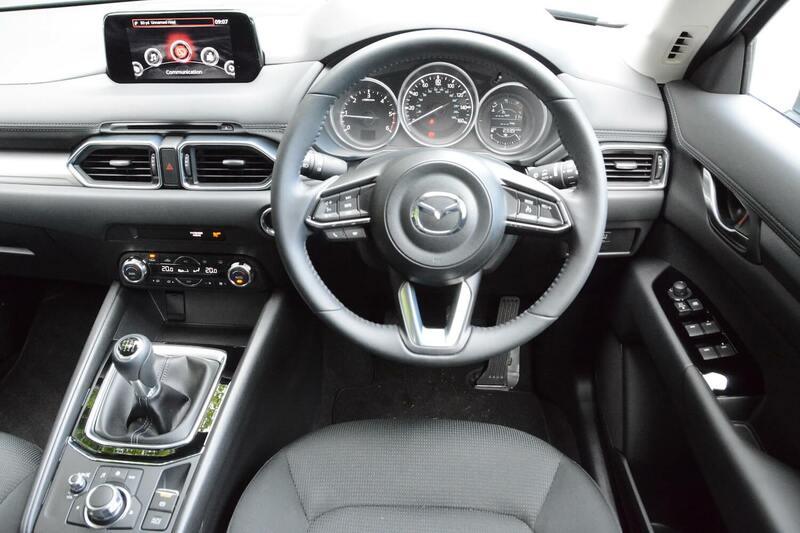 The CX-5’s interior has received a lot of attention to make it more ‘premium’, with more soft touch materials, and this has worked well – it’s certainly a very pleasant place to be. There’s very good news in terms of the infomedia system, which continues to have an iDrive-like rotary controller rather than relying on just a touchscreen. 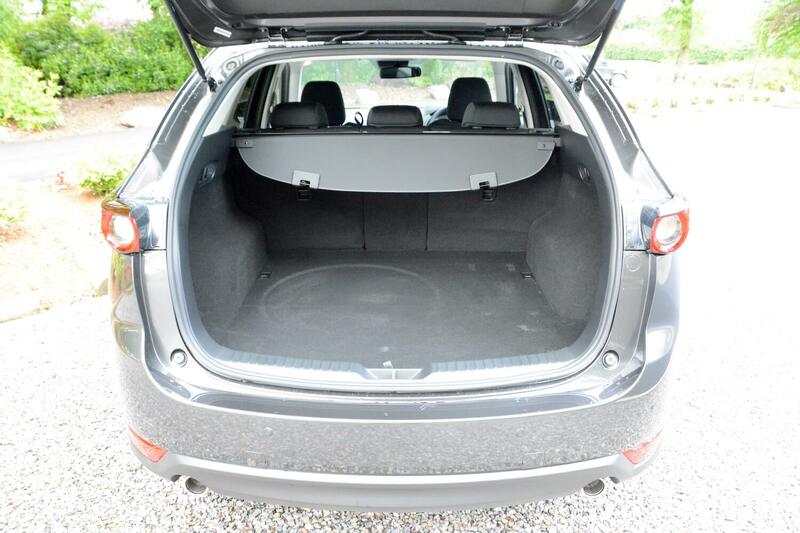 And there’s lots of space in the passenger compartment and in the boot. The driving position is essentially good, although the seat doesn’t go particularly low, as is the case with the majority of SUVs. The range of engines is one element that hasn’t changed compared to the outgoing model. On the launch we drove the petrol model and the higher-powered diesel with four-wheel drive – both on a day when the views of Scotland consisted of a wall of rain rather than any Highland scenery. On day two we drove the 150ps 4-cylinder, 2.2-litre turbodiesel with a 6-speed manual gearbox and front-wheel drive – the biggest seller out of the CX-5 range. 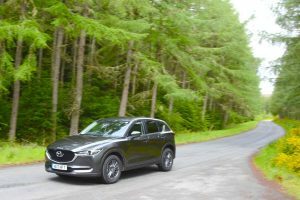 As reported above, we were on the launch of the previous CX-5 model, also in Scotland, and that CX-5 was excellent to drive, with sporty handling and rewarding responses to driver inputs. One of the big changes for the new model is that it’s more refined overall. In order to broaden its appeal, it feels like it has been made easier to live with on the school run. It’s still a good car to drive, but it seems that in the quest for wider acceptance, it has lost a little of its edge as more of a driver’s car. On the first day of the launch event, we drove the 175ps 2.2-litre diesel model, with all-wheel drive. The route was around 6 hours in total, through the Cairngorms, in typical mid-summer Scottish weather, ie. a particularly wet combination of mist and rain. Myself and driving partner Andy Harris were glad we had the higher-powered all-wheel drive model for this route as much time was spent tackling flooded sections of road. For the last leg of the first day’s journey we sampled the petrol engine, which is pleasant enough, and which you’re encouraged to buy based on the current concerns about air quality, but it’s down on torque compared to the diesel model, and it’s not as economical. On day two we had the 4-cylinder, 2.2-litre turbodiesel with a 6-speed manual gearbox and front-wheel drive. This combination is the biggest seller, and you can understand why. The diesel engine strikes a good balance between providing sufficient performance and also being reasonably efficient. Many people will drive this car exclusively in urban and suburban areas and never need all-wheel drive, hence why the cheaper front-wheel drive model is the big seller. The CX-5 has good ride quality – helped by the high profile tyres – and decent handling. The steering is reasonably direct, the gearbox is slick, and all controls are well weighted. 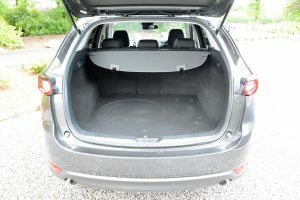 Life inside the CX-5 is quiet, helped by greater levels of insulation compared to the outgoing model. It has an overall driving experience that is direct yet also easy to live with. The official combined economy figure for the 150ps 4-cylinder, 2.2-litre turbodiesel is 56.5mpg, equating to 132g/km CO2. Although we weren’t able to measure real-life economy on a two-day launch event, the display did record an average of 55.5mpg on long drive on a Scottish A-road, suggesting that fuel economy might be reasonable if driven carefully. Of course the big issue today is the impact of diesel emissions on local air quality. There is pressure on motorists to buy petrol, hybrid or electric cars, and impending legislation will only intensify this situation. However the split of sales figures of the CX-5 reflect what the majority of consumers want, ie. the diesel rather than the petrol engine. This isn’t a surprise, as the diesel engine will be more economical and will help CX-5 owners save money on fuel. 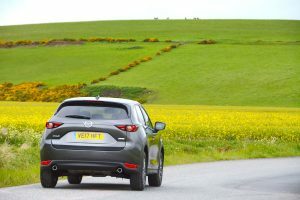 Over recent years Mazda has said that it believes that diesel and petrol engines optimised for real world driving are the way forward, rather than hybrid or electric, therefore it doesn’t offer such powertrains. However as the whole world heads to an ultra-low emission future, the company will have to adopt alternative technologies. The Mazda CX-5 is available with a 2.0-litre 165ps SKYACTIV-G petrol engine with front-wheel drive and manual gearbox, a 2.2-litre 150ps SKYACTIV-D diesel with front-wheel drive or all-wheel drive and manual or automatic transmission, or a 2.2-litre 175ps SKYACTIV-D diesel with all-wheel drive and either automatic or manual transmission. There are two trim levels, SE-L Nav and Sport Nav. Our test car cost £25,695, plus the option of machine grey paint (£680) (compared to other metallic paint options costing £560), taking the total price to £26,375. 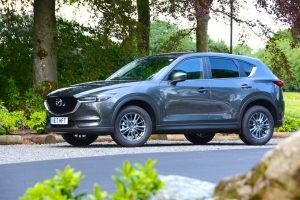 The range starts at £23,695 for the Mazda CX-5 2.0 165ps 2WD SE-L Nav, and rises to £33,195 for the Mazda CX-5 2.2 175ps AWD Sport Nav Auto. We like Mazda as a brand. All of the cars in its current range are good; they combine simple, elegant styling with good driving dynamics. 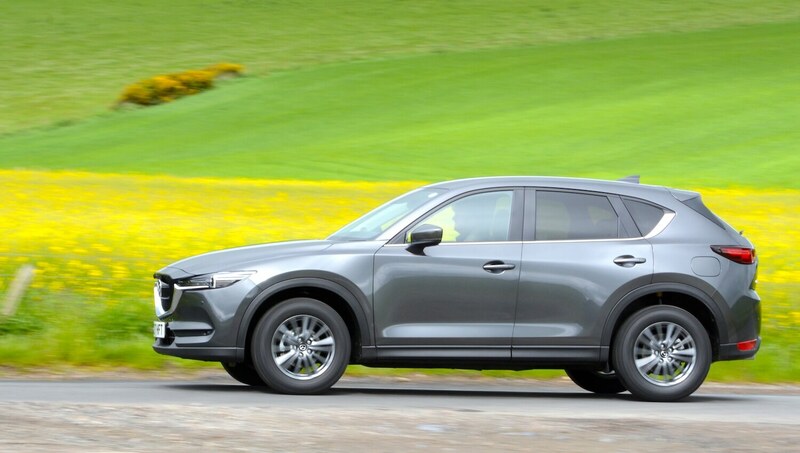 The last Mazda CX-5 was an excellent and practical all-rounder. The new model moves things on as you might expect; design details such as the lights have become sleeker, the overall driving experience is more refined, and the interior is more upmarket. So the new model is an evolution, but it’s not a revolution. 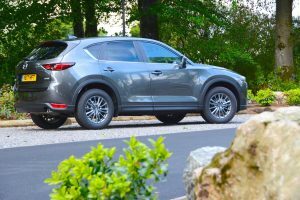 Because sales of the outgoing CX-5 were doing well, why would Mazda break a formula that was working? But the entire range of previous engines is carried over without any significant changes, and critically without any quantum leap advances in efficiency. We can understand why the front-wheel drive diesel is the best seller, but with all the focus on local air quality, in the UK and globally, it’s not going to be long before Mazda will have to offer alternative powertrain options. 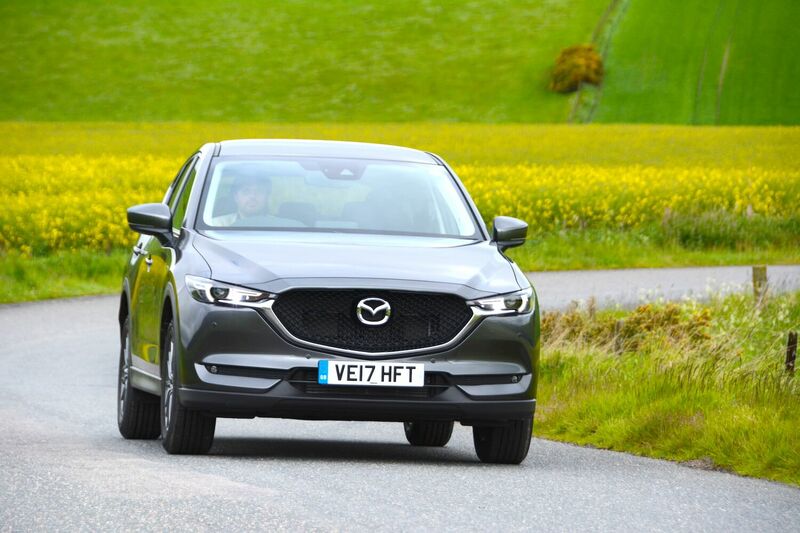 However in the meantime the Mazda CX-5 remains one of our favourite cars in this class and it gains a Green Car Guide rating of 8 out of 10.